This international journal publishes contributions written by and for the political science community, encompassing comparative politics, political economy, international relations, public administration, political theory, European studies and related disciplines. 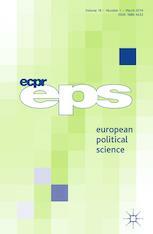 First published in 2001, European Political Science (EPS) presents articles that explore research matters including debates within the discipline, research projects, information sources and funding opportunities; professional matters such as career structures and prospects, external evaluation, higher education reforms and accreditation issues; doctoral training and teaching topics; and relations between academics and politicians, policy-makers, journalists and ordinary citizens. EPS also includes more substantive pieces that provide a political science perspective on important current events. In addition to original articles, each issue includes shorter notes, review articles and symposia, progress reports on lively areas of research, profiles of people in the profession, and book reviews. Reaching beyond its core focus on European affairs and the development of the discipline, the journal also publishes work that compares politics in Europe with other continents and countries, as well as research focused on other regions that would be of interest to its readership of political scientists in Europe and around the world. As the professional journal of the European Consortium for Political Research, European Political Science is a prime outlet for research notes and opinion pieces about the political science profession itself, including teaching and learning contributions. The journal also publishes symposia, academic debates and original datasets.